Even after that he would still mutter in the bar about "people overreacting" and "little Hittlers" and "Bloody HSE". Not surprisingly went on leave soon after and was not allowed back on site. Who was not allowed back on site, him or you? Sorry, HE was not allowed back on site. I was retained for a year until the end of the project as a penance and punishment, probably for my sins in a previous life. In Iran I was told in one particular place: "There are no UXO here". We found UXO (155mm projectile) from the Iran - Iraq war. I was accused: "YOU BROUGHT IT IN WITH YOU". F*ck me gently with a rat tailed podger spanner! That was one was off the web for quickness. I have a few of my own, but I don't have a great camera, coupled with the fact that I am the worlds worst photographer, so I don't have many pics worth sharing. 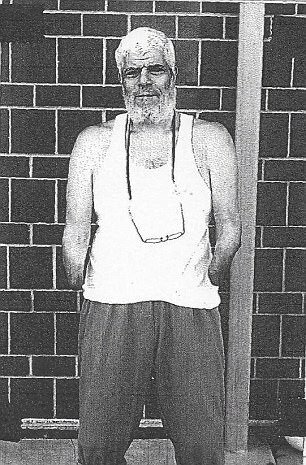 I was looking at a pic of Abu Hamza, or whatever he calls himself, yesterday. He is a former Imam from London - one of the hundreds of hate preachers, rapists and criminals that our government likes to allow into the country as part of its social engineering policy to destroy the UK and purge the country of its Anglo Saxon roots. Hamza was in prison in the UK having spent a lot of tax payers money on appealing his sentencing for criminal activities on the basis that he is of "other ethnic origin", which axiomatically infers that he is not guilty of any crime if he says he isn't and that any court that found him guilty is automatically racist. After about 5 or 7 years of legal bullsh*t he was finally extradited to the USA to stand trial for terrorist activities. The USA doesn't have quite the same reluctance to punish terrorists simply because they are non-white, than the UK does. Anyway I'll come to the point. Here is a picture of Abu Hamsa, minus his w*anking spanners. He has told many lies about how he lost his hands, but I have seen injuries like his before. Now I'm not a surgeon or a paramedic - although I do use paracetamol when I have a headache - but his injuries look like those that people get when they try to remove a fuze from a UXO of the variety, projectile or mortar bomb. People normally try to do this because they want to get at the explosives inside, to use it for nefarious purposes. Like making terrorist bombs. Only, the type of weapons that causes injuries like this don't normally contain bulk explosives. But Abu prolly didn't know that. It looks to me like he was trying to unscrew the fuze from, say a 105mm projectile, carrier, nose ejection, or its mortar bomb equivalent. What happens if you try to remove the fuze from such a UXO - and it is in an armed state (and occasionally even when it isn't armed), is that it may function and the projectile, mortar bomb, whatever, ejects its internal components forcibly (and I mean forcibly - under pyrotechnic pressure) forwards by means of the case splitting somewhere aft of the fuze. I say this because had it had been an HE projectile / mortar etc it would prolly have eviscerated him (and saved us all a lot of trouble) and maybe taken his face off as well (not much loss there then!). Had he been bending over it, when it discharged its contents, it would have taken his head off too. (ditto). 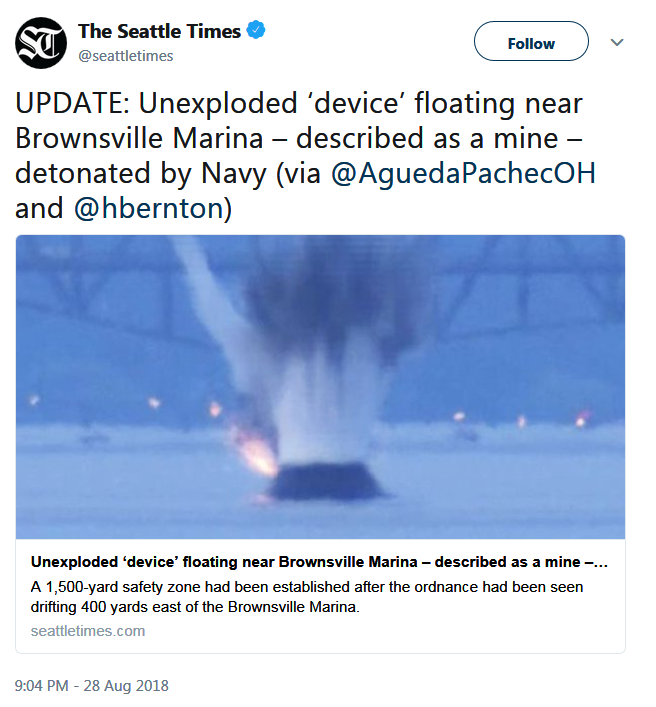 So he was probably standing with the projectile in a vice (base up in the case of a base ejection projectile and base down in the case of a nose ejection projectile), attempting to (prolly if it was nose ejection) unscrew the fuze, when it went WHOOSH (with a loud bang as well) and discharged its contents, removing his hands in the process. I wonder how he wipes his bum? Not that I care, he is a terrorist. As the Germans say: wie heißt ein mann mit ohne hämorrhoiden? Antworten: Ein perfekt Arschloch! Excellent! See? The EOD way is the best way! The Laurel and Hardy effect seems to be out in force there. Interesting article Dan, many thanks. If you know anybody involved with this issue we (more specifically, Matt) could help with information on the bombs/fuzes etc. subject to getting a bit more detail. Do you know anyone working on the project? Unfortunately, no. The writer of the article lists his email and Twitter at the bottom of the article and the general email for Khaosod English News is at the very bottom. Let us all know what, if anything, you find out. It would be great if you could help them out. I'd hate to be the local guys that gets volunteered with no real knowledge, and having to follow orders. No worries, Dan, many thanks. Matt would reply in person to this but he's currently in a sort of Ku Klux Clan suit attending a neighbour's funereal in Saigon. I'm sure he'll chip in later. I have sent the article's author an e-mail. Anyway, the purpose of trying to connect with someone who's involved with the project is to try and offer advice on likely bomb types and fuzing mechanisms etc. If we can help the local guys who are now saddled with this problem and can provide them with pertinent questions to ask during discussions, then at least it might be of some help. Likewise any of the military units that get tasked with dealing with the bombs. We'll do what we can to help people reduce risk even if it's just remote verbal input. A few years back Matt worked with Thai special forces EOD personnel on an oil & gas-related UXO clearance project and formed a great working relationship with them. 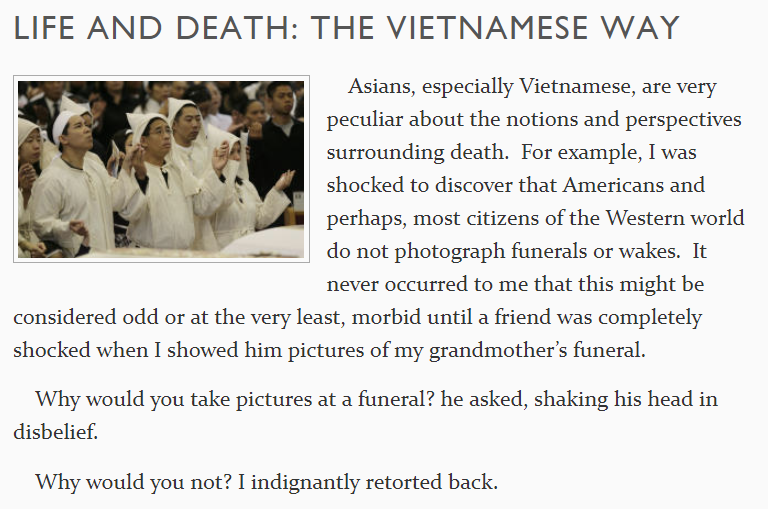 I guess I could have put the link to the whole article about Life and Death: The Vietnam Way. And the chanting still hasn't finished. There was also a bloke playing what looked like a snake charming pipe thing. But no snake. Well, yeah. When I came back from paying my respects (two joss sticks, one for the altar on the left with the two God bods in it and one for the altar with the dead blokes picture on it. Bow three times at each place and place a joss stick in each sand filled receptacle, bow to the bloke in KKK suite and out the door. The next gathering will be more interesting as there will be beer. Oh and I had to carry garlic in my pocket and when I came back I had to step over burning paper 7 times before I could get beck into my own place. There are some parallels with Western superstition here too as, in years gone by, garlic was carried by people to ward off vampires.